Some of our favorite foods and beverages also contribute heavily to staining your teeth. Foods like berries, pasta sauce, popsicles, and drinks like wine, coffee, and tea can all cause discoloration of your teeth. One of the most effective methods to brighten up your smile is teeth whitening. But there’s another way to prevent stains in the first place–and it may even keep you from visiting your general dentist. Monrovia patients that practice regular brushing and flossing of their teeth could be able to stop stains in their tracks. In this blog post we’ll explore how stains are caused on the teeth and we’ll also talk about how brushing your teeth can help. If your teeth are brown or have started to develop a yellow color, make sure you call Dr. Q today at (626) 599-9819 for your general dentist. Monrovia patients are often shocked at how much brighter their smile can be after just a single teeth whitening treatment. It takes about an hour and you’ll love the difference. Just take a look at our Reviews page to read about the experience that our patients have with Dr. Q. Some tooth stains actually happen inside the tooth. For example, if a patient experiences trauma to the tooth (like a fall or accident) that causes bleeding inside the tooth, this can cause the tooth to become discolored. However, the more common stains happen on the outside layer of the tooth called the enamel. It is these types of stains that can sometimes be prevented with good oral hygiene. Plaque – The bacteria in your mouth form a sticky layer called plaque on top of your teeth. This plaque layer attracts the stain-causing components of many foods and drinks. But with regular brushing, especially before and after meals, you can eliminate this plaque layer. Less plaque means less chance of stains on your teeth. Cavities and decay – Cavities are caused by the bacteria in your mouth wearing through the outer layer of protective enamel on your teeth. The resulting infection and decay cause brown spots on your teeth. Good dental hygiene can reduce the damage that the bacteria cause and keep your teeth brighter. Removing dyes – Finally, regular brushing helps to eliminate and flush out the stain-causing elements in your food. Drinking wine and coffee or eating dark-colored foods like blueberries without brushing gives those liquids more time to stain your teeth. Plus, another huge benefit of brushing and flossing your teeth regularly is that you’ll have healthier teeth and reduce the chances of needing to see your general dentist. 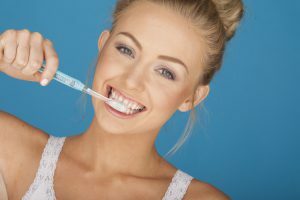 Monrovia patients with good oral hygiene get all kinds of terrific benefits from brushing regularly. Monrovia patients with discolored teeth don’t need to hide their smiles any longer. Our patients often walk out of their teeth whitening procedure with a smile that is a few shades brighter. Plus, our patients love how kind and gentle Dr. Q is during all of their appointments. We know how much anxiety many of our patient’s experience which is why we are proud to provide a variety of sedation dentistry options. We want you to be comfortable from the moment you walk in and throughout your procedure. Call our Monrovia office today at (626) 599-9819 to get started.